Blurb Description: Seventeen-year-old Anouk envies the human world, where people known as Pretties lavish themselves in fast cars, high fashion, and have the freedom to fall in love. But Anouk can never have those things, because she is not really human. Enchanted from animal to human girl and forbidden to venture beyond her familiar Parisian prison, Anouk is a Beastie: destined for a life surrounded by dust bunnies and cinders serving Mada Vittora, the evil witch who spelled her into existence. That is, until one day she finds her mistress murdered in a pool of blood—and Anouk is accused of the crime. 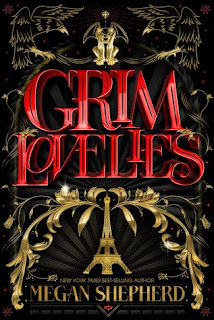 IN A NUTSHELL: Grim Lovelies DEFIED my every expectation by creating an intricate world filled with Magic and its consequences, well buried secrets, an unusual family, love, betrayal, murder, technology and power and it was SUCH a joy to read. Truth be told, I didn’t know what to expect, going into Grim Lovelies. It was my first book my Megan Shepherd, and while the cover was STUNNING, the description made it sound like there was a lot going on, and I didn’t know if all these elements would work together to form a good book. And yet, somehow, it WORKED. 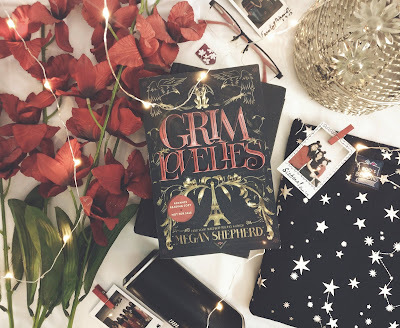 The magic, the vitae echo, the Haute, the beasties, witches, goblins, pretties and the Whispers – it all just came together in the wondrous 300+ page book and I AM DYING TO GET MY HANDS ON THE SEQUEL, and this book hasn’t even released yet. 1. HOW BEAUTIFUL IS THAT COVER? The designer in me is freaking out, turning it under different light angles and just MARVELLING at it. SO SO PRETTY. 2. This book started off, as almost all books do, rather slowly. It took me a while to get into in, as well as remember who all the characters were, but suddenly, after a certain death that the blurb promises, things got VERY VERY interesting. 3. As I always say, give me the worst character in the book, and I’ll probably fall in love with him. The same went for Prince Rennar in this book, ruler of the Haute (the magical order) Although we saw him in a grand total of three scenes of this book, he and his dark and twisty and morally grey logic and I fell for him. Whoops? 4. I ABSOLUTELY LOVED THE DESCRIPTIONS OF PARIS. Two of my closest friends just spent a semester there, and I’ve heard so much about the place, I practically felt like I was at home through Anouk’s descriptions as she was out in Paris for the first time. 5. Which brings me to HOW MUCH I LOVED ANOUK. She was this loyal, trusting skilled witch filled with courage and love for her family and she is basically one of the BEST new protagonists I’ve seen in a while! 6. I also loved the rest of the Beasties. I feel like we didn’t see enough of Luc and Hunter Black for me to really fall for them, but I LOVED Beau and Cricket. I loved how they each embedded their own animal traits and still found a way to be a human family. 7. 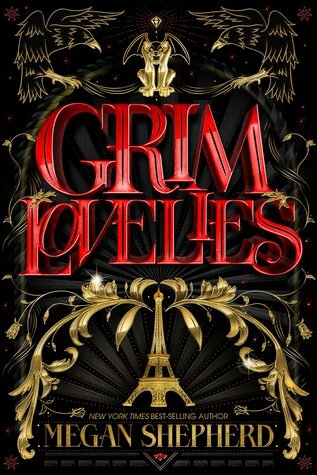 Grim Lovelies was enchanting also strangely funny. I loved the dark magic, and the Marble Ladies and the vitae echo, but there were also love spells, magic gargoyles and enchanted bears named Toblerone. There was politics, power games, magic castles whose layouts change on the hour, dark Princes, familial elements and really, HOW CAN YOU ASK FOR MORE IN A BOOK? I basically fell in love with this book. It was everything I didn’t expect and I can’t recommend it enough. Have you read any titles from Megan Shepherd? What did you think of them?